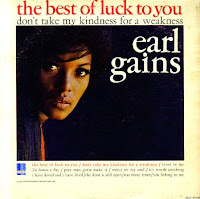 Earl Gaines was an American R&B singer. 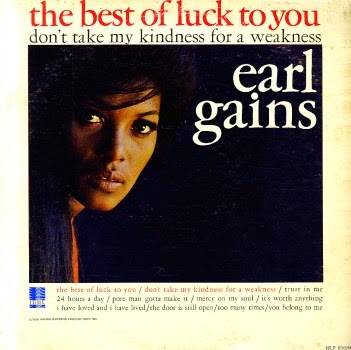 Earl Gaines was born in Decatur, Alabama in 1935. In the early 50s he moved to Nashville, and found work both singing and playing drums in R&B clubs. He worked with the band Louis Brooks and his Hi-Toppers, and also sang on demos for R&B songwriter Ted Jarrett. He recorded one of Jarrett's songs with the Hi-Toppers, "It's Love Baby (24 Hours A Day)" , and it became a massive hit when released on Excello Records, getting to #2 on the national R&B chart. There were more singles with the Hi-Toppers, but as Louis Brooks was unwilling to tour Gaines soon went solo. Over the next few years he recorded singles for various small labels, but gradually the touring became less frequent, and by the 60s was having to find work outside the music industry to support himself. In 1966 he was signed to the HBR label with the help of Nashville radio DJ Bill 'Hoss' Allen, who also became his producer. His first single with the label, "The Best Of Luck To You", became a #28 R&B hit. He also recorded a full album that was released on HBR, featuring some really great southern soul and blues material, including a re-recording of "24 Hours A Day". However they did mange to mispell his name on the cover! So happy to have stumbled this fount of. Thanks for all your efforts. By the way, it's "misspell".